The DMP 8500 Factory Solution is engineered for uniform, repeatable part quality and high productivity in metal 3D printing with a low total cost of operations (TCO). Scalable Factory Solution – The DMP 8500 Factory Solution is comprised of function-specific modules. 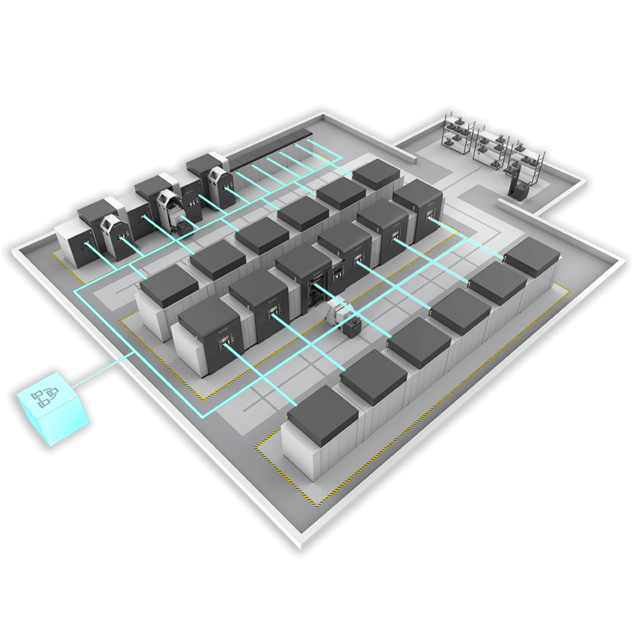 Each module within the factory solution is fully integrated with a Removable Print Module (RPM) which is vacuum sealable for a controlled print environment and engineered to move between printer and powder modules for a continuous production workflow. Uniform, Repeatable Quality – The RPM of the DMP 8500 provides consistent powder control, batch after batch to deliver scalable metal additive manufacturing. Featuring a vacuum chamber to ensure the lowest O2 content, the DMP 8500 printer module provides high quality 3D printed metal parts. Powder waste is eliminated, as the vacuum chamber guarantees consistent high material quality, sufficient to be used again and again. Metal 3D Printing – The modular design of 3D Systems DMP 8500 Factory Solution enables continuous function of all metal 3D printing and powder management modules to maximize uptime, throughput and operational value. High Productivity – With a large build volume (500 x 500 x 500mm) and high throughput enabled by multiple lasers, the DMP 8500 Factory Solution delivers high productivity in metal additive manufacturing. Seamless Large Parts – The intelligent laser configuration and 3DXpert™ driven scan technology of the DMP 8500 Factory Solution enables the production of seamless large parts the size of the full build volume. This results in the highest surface quality for metal 3D printed parts with outstanding material properties.